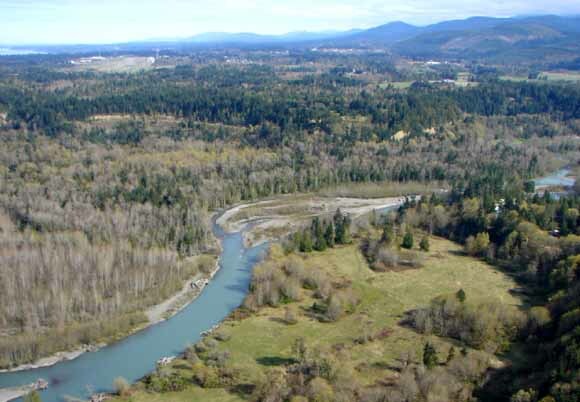 Analyses of historical aerial photographs of the lower Elwha River, Clallam County, Washington, reveal rates and patterns of channel change in this dammed, anabranching river between 1939 and 2006. Absolute positional changes of the active-floodplain margins, which commonly exceeded 50 m over that interval, have exceeded 400 m locally. Annualized rates of channel movement were typically ~2 to 10 m/yr; higher annualized rates over some time intervals are attributable to the formation of new channels by episodic avulsion. Channel movement by more gradual lateral meander migration was also common. Anthropogenic modification of the floodplain between the 1940s and 1980s substantially altered channel form and position. This analysis of rates and patterns of channel change over nearly 70 years on the lower Elwha River is intended to characterize the evolution of the river throughout most of the time interval when two large dams have been in place upstream. Channel morphology and rates of channel movement are expected to change significantly in response to removal of the dams and re-establishment of the upstream sediment supply during a major river-restoration project. Download this paper as a 32-page PDF (sir2008-5127.pdf; 122 MB). This report is also available only on the Web.